The Journal of Occupation Health (Japan) conducted a comparison of different materials the same thickness to determine heat insulation capability. In comparing the difference in temperature between covered and uncovered areas of skin, the differences were plotted in the graph below, material types plotted on the Y-axis and temperature difference plotted on the X-axis. 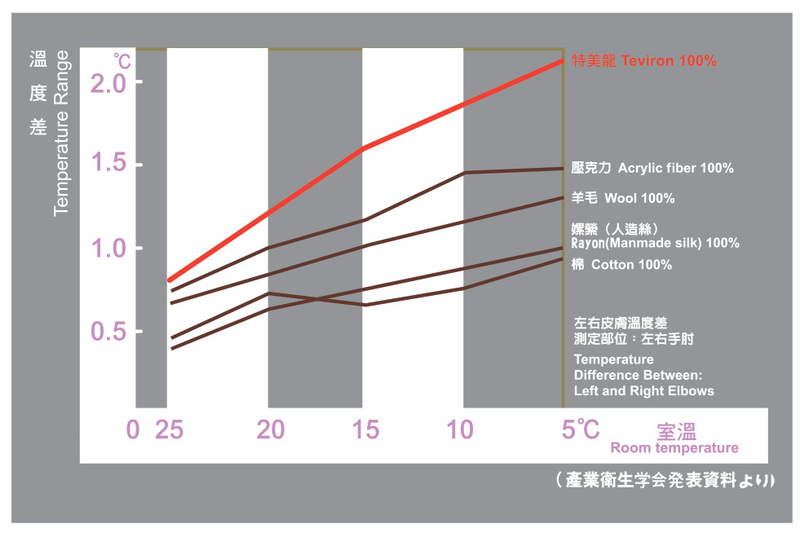 At 25°C, the different materials showed little temperature difference, but at 5°C, there was an obvious difference in heat insulation, with the Teviron material showing its superiority in retaining heat even at low temperature. The two figures on the left are derived from a report by Teijin Limited Company of Japan. 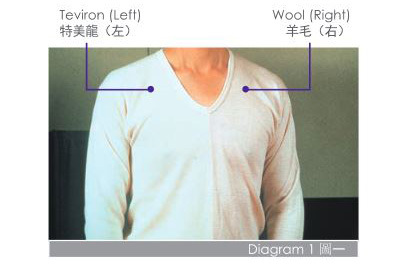 The long sleeve undershirts in the images are made of wool on the right side, Teviron on the left. 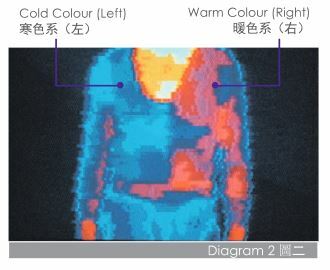 A heat sensor was used to register the temperatures and the results were displayed on a computer (higher heat dispersion is represented by warmer colours and vice versa). When the laboratory temperature was set to 5°C, the colour between the wool (warm colour) and the Teviron materials (cold colour) clearly shows the superiority of the Teviron in maintaining warmth. The diagram 2 is taken from a study by the Carl Marx Textile Research Institute of Germany. Since Teviron has great heat insulation and does not absorb water, many people might think that Teviron is not a breathable material and therefore would be uncomfortable to wear. However, as you can see from the chart, Teviron allows very rapid water dispersion and therefore keeps the person inside dry and warm. We call this " sweat dispersion technology", and the only material that can reach this level of sweat dispersion is Teviron. The diagram 3 is taken from a report by Teijin Limited Company of Japan. Specially designed clothing (one side made of cotton, the other Teviron) was worn by a subject while exercising and sweating. The cotton side took approximately 40 minutes to dry, but the Teviron side only needed 10 minutes to become completely dry. Japan Fire Retardant Association (JFRA) Teviron ensures every individual's safety, with its inherently fire retardant quality. Teviron was awarded the Fire Resistance label. When two fabrics rub against each other, one side generates positive static electricity while the other generates negative static electricity. When rubbing against all fabrics or skin, Teviron can generate negative static electricity. The unique negative ion effect generated by Teviron is good for health. The diagram 1 indicates the results measured by a static electricity detector. By rubbing Teviron against wool, the indicator pointing towards the left shows that negative static electricity were present in Teviron and positive static electricity were detected in wool, as shown by the indicator pointing towards the right. The diagram 2 is a static comparison chart for various fabric compiled by the Textile Research Institute of Japan. This proves clearly that Teviron can generate negative static electricity when rubbing against all fabrics.